In the past, Wilfrid Laurier University students who were required to withdraw from the school due to lack of academic performance had to leave the Laurier community and successfully complete two college or university courses at another institution before they could reapply for full-time status at Laurier. Only 10 per cent ever returned. Now, thanks to the new Strategies for Academic Success pilot project set to launch this fall in the Faculty of Arts, students have another option – and a greater chance of success. 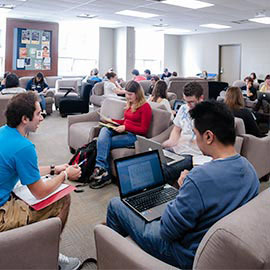 Under the pilot project, students will have the opportunity stay at Laurier to complete the necessary upgrades. They will begin with two six-week, non-credit courses and a half-course for credit, running in parallel to the regular academic term. They will remain part of the Laurier community, stay connected to their cohort and their peers, and have access to academic advising and resources. During the fall term, students will enroll in two six-week, skills-based courses, taught by a team of instructors in an active-learning environment. They will cover areas such as time management, effective writing and speaking, critical thinking and study skills, and research and academic integrity. Students will then apply the skills learned in these courses in a half-credit course in their faculty. Practical support is built in throughout the term, through compulsory biweekly meetings with peer mentors and academic advisors. If students pass the non-credit courses and receive a 4.0 GPA in the half-credit course in the fall term, they will continue to the winter term under part-time status. If they achieve a 4.0 or higher in the winter term, they will move up to full-time studies in the spring. Those who receive between 2.0 and 3.99 GPA in the winter term will continue on probation for their next academic term, and can then join full-time studies if they achieve 4.0 or higher. Following their successful term, students will receive practical support and academic advising for one year to monitor their progress and ensure they continue toward success. Performance will be tracked following each year of the three-year pilot, and data will be made available to evaluate the pilot’s effectiveness. The Strategies for Academic Success team is led by Rowinsky, and includes Clayton McCourt, MA in Student Affairs Administration, Department of Residence; Crystal Shadwell, Faculty of Arts academic advisor; Ian Schwartz, Faculty of Arts academic advisor; and David Shorey, MEd, Department of Residence. For more information, email artsadvising@wlu.ca.